Famed Inventor Says He Buried Reporter 'At Sea' After His Homemade Sub Sank : The Two-Way Peter Madsen pushed off in his submarine with a Swedish journalist, but by the time he was rescued, she was gone. Now, he says she died onboard — but the admission is stirring even more questions. 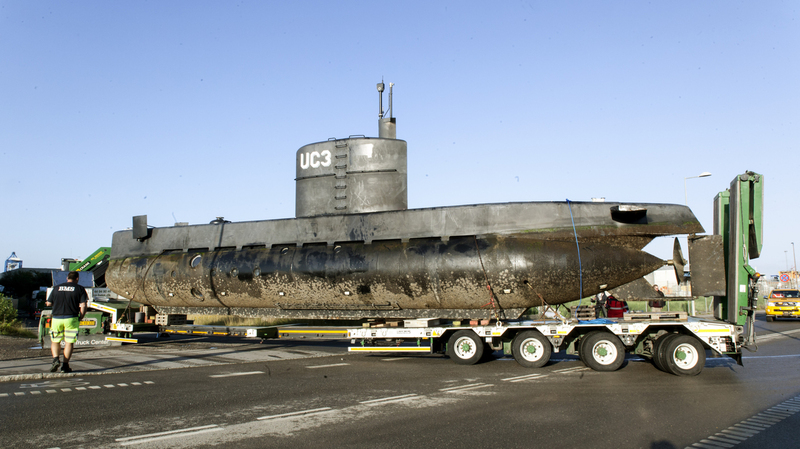 Peter Madsen's privately owned submarine UC3 Nautilus, now a suspected crime scene, gets carried out of Copenhagen harbor on a truck for forensic police investigation earlier this month. Update at 5:50 p.m. ET: At a news conference, Copenhagen police said a woman's torso — which was missing its head, arms and legs — was discovered later Monday in shallow water near Copenhagen. But they cautioned it was "too soon" to determine officially whether it was Kim Wall's body. When the UC3 Nautilus sailed from the Port of Copenhagen on the evening of Aug. 10, the homemade submarine bore just two people: its famed Danish inventor and a Swedish journalist reporting on his invention. 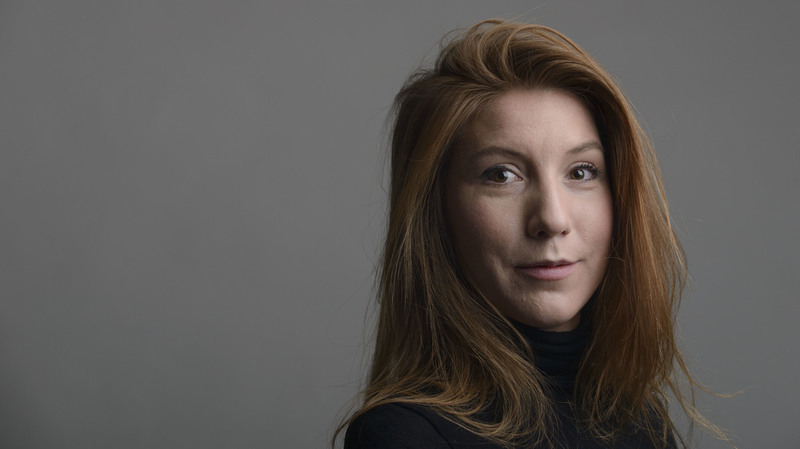 Peter Madsen's submarine sank midday Aug. 11; he was rescued by a private boat, but journalist Kim Wall was nowhere to be found. It was Wall's boyfriend who reported her missing, and authorities wasted no time in arresting the 46-year-old Madsen after he came ashore, charging him that same day with manslaughter and arranging his first court appearance for the following day, a Saturday. Initially he told authorities he had dropped off his 30-year-old companion back in Copenhagen. Now, according to a statement released Monday by Copenhagen police at the behest of the defense and the prosecutor's office, Madsen has recanted that story. "The defendant has explained to the police and the Court, that there was an accident on board which caused Kim Wall's death," police say in the statement, "and that he consequently buried her at sea at a non-defined location in the Bay of Køge." Authorities said the manslaughter charge still stands, even as they probed the waters around Copenhagen for any sign of Wall's body. Danish and Swedish maritime authorities have recovered the 60-foot-long submarine and have since begun forensic work to seek some answers. But they note their days-long search for Wall has so far proved fruitless, despite the deployment of a number of vessels, divers and helicopters. They offered no further details but noted that the investigation "is being conducted behind closed doors." Through his attorney, Madsen has denied the allegations. "Mostly, there's just a lot of people wondering what happened on the submarine. You know, she was a journalist. Did she have dirt on him? And what was so sensitive that that hearing on Saturday had to happen behind closed doors? It's said that some of the information could've been offensive to the victim's family, but we don't know what that could be." Swedish journalist Kim Wall posed for this 2015 portrait in Trelleborg. After more than a week of questions, a statement released Monday acknowledged Wall died aboard Danish inventor Peter Madsen's submarine. Madsen, who is now being held on a manslaughter charge, says he subsequently "buried her at sea," according to the statement. Compounding the speculation is Madsen's outsize reputation. Something of a "wannabe Elon Musk or Richard Branson on a much smaller scale," according to Overgaard, the man often known as "Rocket Madsen" has built three submarines with the aid of crowdfunding and aspires to send a homemade rocket to space. "Everybody here has their own theories on what happened," mystery writer Lone Theils tells The New York Times. "I haven't been anywhere at dinner or coffee with more than two people where this story didn't come up. People share what they've heard and what they think." But for those who knew Wall personally, her death is less a compelling mystery than a tragedy, one that offers sad lessons of its own. "There's a dark irony [that] Kim, who traveled to North Korea and reported from Haiti, should disappear in Denmark," colleague Victoria Greve wrote of the freelance journalist in a Swedish paper, according to a Times translation. "Perhaps it speaks to the vulnerability of female freelance journalists. To work alone and do everything."